made rookie cookie's banana cream tart the other day. I wanted to use my new springfoam pan and I didn't get a heaping slice of banana cream pie at thanksgiving this year. for some reason, no one made that pie! what? so sad. this tart was easy, delicious and makes great leftovers (for breakfast like I did this morning) even with a soggy crust (and I'm not a soggy kind of person). plus, it looks pretty even when it's not perfect (see above). Set oven to 375 degrees. In the bowl of a food processor combine almonds and wafers. Process until crumbly. Add melted butter and process until combined. Press mixture into the bottom of a 9 inch tart pan or springform pan. Bake for 8-10 minutes, until the crust is fragrant and slightly firm. Allow to cool. Lay banana slices into the bottom of the pan. Prepare pudding according to package directions and evenly spread over the bananas. Cover with plastic being sure to gently press the plastic right onto the pudding so a skin doesn't form. Refrigerate for at least 3 hours or overnight. In a medium bowl, combine heavy cream, powdered sugar and cinnamon. With a hand mixer, whip until soft peaks form. Remove plastic from the pudding and spread whipped cream evenly over the top. Remove tart ring or springform ring and cut into slices. um. YUM. I love banana cream pie! This looks so good! 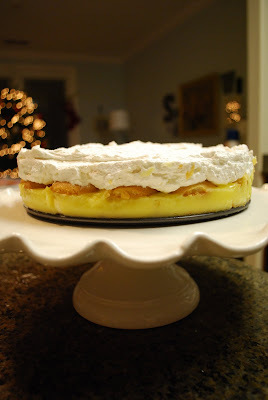 I know, why didn't anyone make banana cream pie this year!? I was bummed. So glad you liked it. It is quite delightful, if I do say so myself. I can't tell you how bizarre it is that people make my sister's recipes. Not that she's not a fabulous cook--she is. It's just bizarre.